This played Sundance, got glowing reviews and got bought by Amazon for a bunch of money. It's been out for a couple weeks and I finally got around to seeing it. I really like Kumail, I used to see him when he would pop in at random NYC comedy events, and like Aziz has done with Master of None, it's important to see Indian and Pakistani romantic leads that aren't desexualized or played as jokes or stereotypes. It's also crazy that this is basically a true story. And I'm glad this movie seems to be connecting with people, I just wish it were better. - For the most part I think Kumail and Emily Gordon are let down by Showalter and Apatow. They're writing from the heart but at a certain point the two more experienced filmmakers needed to hone those raw materials into a film that utilized them better. - The biggest issue with the film is the issue with most of Apatow's recent work: it's 30 minutes too long and you feel every minute of it. For a "rom-com" it's 2 hours and really should not be. The film has like 12 endings and 3 or 4 scenes to communicate something when 1 would do just fine. Regardless of if some of these funny moments are true or interesting individually, they bog the film down with the mid-section that spends a looooong time at the hospital and grinds the film to a halt. - Tonally it can't really decide if it wants to be a rom-com that plays in wide release or a shaggy Sundance film that has a more realistic texture to it. Either would be fine but it wavers uneasily sometimes between both. The ending, for instance, plays like a rom-com, perfect callback to the setup that precedes it at the beginning of the film but it doesn't really fit with the film that precedes it. - I'm surprised that Emily Gordon co-wrote this script because as a character she is hardly present in the film. I realize dramatically she is absent for about half the running time, but her character isn't established strong enough in the first act that she feels like more than anything as an object of Kumail's journey, rather than her own character with needs and wants, etc. That's also fine, dramatically, just surprising that her character doesn't share more of the film's dramatic weight other than as a device. - The drama feels manufactured from the initial setup where she finds the cards of other women. Instead of responding like a normal person who has only been dating someone for a few weeks, like in a playful manner, she goes ballistic right off the bat and comes off like kind of a basket case. Kumail gets set up on dates by his mom, doesn't really participate and shoves the pics in a box. It's not really worth having a blow out over. The scene might've been more believable if it escalated in an Eyes Wide Shut way, where it starts playful but ends with more emotions and jealousies coming out. 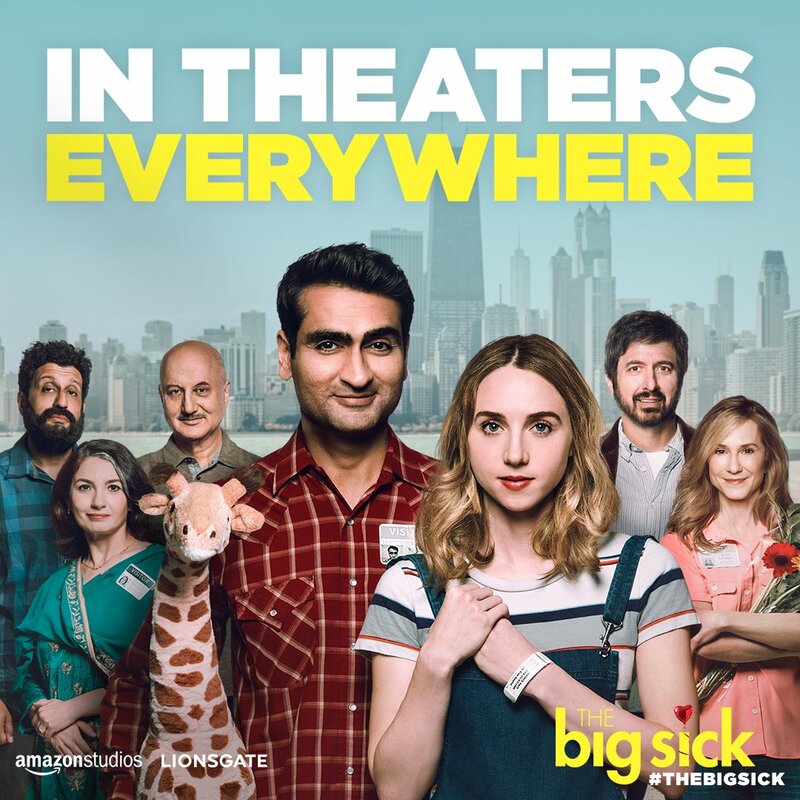 - The parents get way, way, way too much to do in this story when it needs to be about Kumail's journey or Kumail and Emily's journey. It's like they cast actors as good as Romano and Hunter and then had to invent more for them to do and just couldn't bare to lose it. The cheating storyline (a fiction invented for the film) gives them something to play against, but again, just weighs the film down, makes it toooooo long and doesn't really help Kumail learn anything so why? - Small personal pet peeve but I feel like I've seen too many films/TV shows where the actor is a stand-up/comedian and so is the character. This isn't really an issue but IMO if you even make the character's occupation like 10-15% different (a different sort of creative pursuit), it gets a little more interesting and less self involved. - The script just feels a little sloppy in other ways like, two of his dates mention how much he loves the X-Files but his character NEVER mentions the X-Files. When he's watching a movie it's Night of the Living Dead, not the X-Files. The poster in his room is Shaun of the Dead, not the X-Files. Like these would've been easy places in insert it so at least we can establish that he likes this show. Instead we are taking their word for it. In real life he hosts an X-Files podcast, which would've been an easy way to insert that tiny bit of info into the film. - Dramatically, Kumail saves Emily by remembering her hurt ankle which ends up sending the doctors down the right path towards figuring out how to help her. So why do we ALSO get the whole drama where he has to convince the parents not to move her to a different hospital? So he can double-save her? Even if that bit did happen, it seems dramatically repetitive. But again, I don't really blame the screenplay for any of this. I blame Apatow, who shepherded it for years and Showalter, who should've known what to trim in the edit to make the best film. Things I liked: Kumail is good. The first 30 minutes are strong and funny. The aforementioned portrayal of cultural differences, which definitely shares some DNA with the parents/religion ep of Master of None season 2. And Showalter is pretty good with the camera. This did not look like one of those uber-digital, sitcom lighting, two shot, comedies. It looked like a "real movie" which is no small feat nowadays. I know it feels like between this and Baby Driver I'm just here to rain on parades, but I'm really not. Just wanted this to be better. Looking forward to the eventual Jenkins rebuttal (JK, I'm not looking forward to that). my name is lowercase and i just read your last line. it's cool. it's cool. this movie isn't on my radar. The parents get way, way, way too much to do in this story when it needs to be about Kumail's journey or Kumail and Emily's journey. I mean, I haven't seen the movie. But from what I've heard, I thought one of the fun twists was that it's more a rom-com between Kumail and her parents. I guess that's interesting but the way it's presented in the film, less so. Also: why do the filmmakers hate The Smiths and how in the world was this not called Girlfriend In A Coma? I'm pretty sure they would get in legal trouble for this (see Morrissey biopic with no Morrissey music). BUT that's exactly what I thought. I know, I know, it's serious.